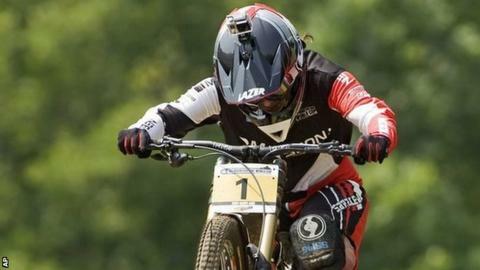 World champion downhill mountain biker Manon Carpenter says the pressure is on her rivals ahead of this year's World Championships in Andorra on Sunday. The Welsh rider, 22, won the World Cup and the World Championship in 2014, but finished as runner-up overall in the World Cup this year. British compatriot Rachel Atherton clinched the series after winning six of the season's seven races. "Considering the year I've had the expectation is on others," she said. Crashes and a disqualification early in the season put Carpenter out of the title race this year, but second place finishes in three of the final four rounds indicated her form is improving. "I'm in quite a good place now, I've slowly got to where I want to be. The last World Cup round I felt a lot happier on the bike," she told BBC Wales Sport. "It'll be nice to finish the season on a high and prove what I can do. I feel I haven't quite done that this year." The 2014 champion joins Atherton and Tahnee Seagrave in the Great Britain team competing at Vallnord, Andorra. "Rachel's been the one to beat all year, but I'm not focusing on anyone. You're racing against yourself down the hill and I'll try to go as fast as I possibly can," Carpenter added.